Nerves carry messages back and forth from the body to the brain. Some control motion while others control sensory functions that allow us to feel such sensations as heat, cold, pressure and pain. When our nerves are injured, either through crushing, stretching, or cutting injuries, motion and/or sensation can be impaired or lost. 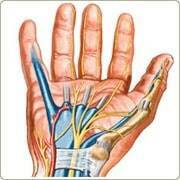 Not all nerve injuries cause permanent damage nor do they all require treatment by a hand specialist Dr. Fiore. They might be ‘stunned’. The technical term for this condition is neurapraxia. In some instances, however, treatment such as hand nerve repair surgery is needed. The severed nerve can sometimes be sutured together if the two ends can be placed together without tension. If the tension is too great, a conduit or tube can be placed between the two ends to help guide the regenerating fibers. The fibers grow at 1mm/day so the post op course can often feel prolonged and patients will often need reassurance. In other instances where the nerves cannot be repaired without tension, a nerve graft may be used. A nerve graft takes a nerve from another area of the body, often the lower back of the leg, and moves it to the injured area to restore nerve function. This option will result in a numb area in at the donor site. Because nerve conduits such as cadaver nerves are available and have shown some promising results, nerve repair through grafts is being performed less and less, and problems at the donor site are not as much of an issue. The Patient’s Age: children tend to see more complete results than adults. Patients over the age of 60 may see only partial nerve function restoration with some injuries. Type of Injury: cutting injuries tend to affect a much shorter area than injuries incurred by stretching or crushing and may have more successful treatment outcomes. Extent of Injury: the longer the distance the nerve axioms have to re-grow, the slower the recovery, and, generally, the poorer the results. Smokers: Nerve repair is one of the many functions inhibited by smoking and if possible should be stopped or at the very least, cut back. Dr. Fiore specializes in the diagnosis and treatment of Nerve Repair. He is board certified by the American Board of Surgery and fellowship trained in hand and microsurgery. For more information on treatment options, or to schedule a consultation, call Fiore Hand and Wrist at (281) 970-8002.